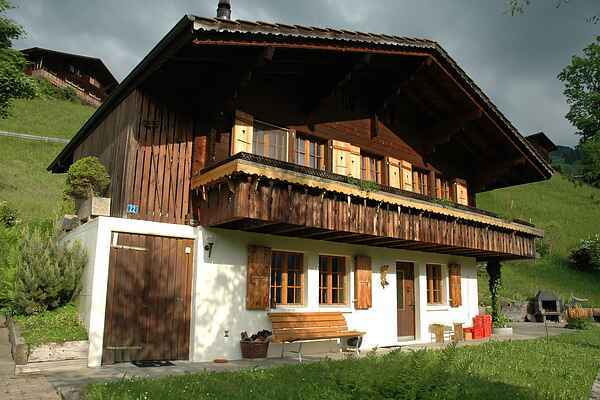 Chützli is a detached chalet located high above the Diemtigental with a view of the Turnen. A wonderful spot to enjoy the outdoors, tranquillity and the area's majestic natural beauty. The large terrace with a grill and sun loungers is a great place to spend time. This little paradise is reached via a winding mountain road, and you park your car in a garage 100 metres away. You can reach many of the high points of the Bernese Oberland from your chalet: Gstaad, Lenk or the cosmopolitan town of Thun on the lake of the same name. Or Grindelwald with the Jungfrau, the highest point in the Bernese Oberland. Berne is certainly worth a visit as well, and even Valais with Zermatt and the Aletsch Glacier can be visited as a daytrip.